These Chocolate Almond Soufflés with Amaretto Glaze are quite the impressive dessert. The intensity of the dark chocolate and sweet almond flavor combine to create a deliciously rich dessert. Disclosure: This is a sponsored post written by me on behalf of Nielsen Massey. All opinions are 100% my own. “My Mama always said, ‘Life was like a box of chocolates. You never know what you’re gonna get. '” – Forrest Gump. Forrest’s mama couldn’t be more right. Life is like box of chocolates. It’s unpredictable, fickle, and full of undesirable responsibilities. So, yes, life is a lot like a box of chocolates. I may not have complete control over every aspect of my life, but I refuse to guessing games where my dessert is concerned. It’s not fun thinking you’re going to get a creamy salted caramel center and end up biting into a mush of unquestionable green goop. Not cool, chocolate, not cool. I have nothing agains surprises. A surprise birthday party–you shouldn’t have, but I love it. Surprise, you won the lottery! Peace out, peeps, I’m moving to Bermuda. I do not like surprise-inside chocolates, because when push comes to shove, the chances of choosing something yummy are slim to none. I like to know, for a fact, without a doubt, what it is I’m eating. Jennie doesn’t like food surprises. Got it? 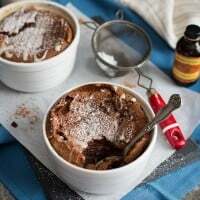 You know what’s in this Chocolate Almond Souffle with Amaretto Glaze? Chocolate, almond extract, and amaretto liqueur. Imagine that. These delicately puffed chocolate soufflés are spiked with amaretto liqueur and Nielsen Massey Pure Almond Extract. The combination of almond extract and amaretto liqueur give the soufflés a burst of sweet almond flavor that pairs perfectly with the intensely rich dark chocolate. Surprisingly, souffles are extremely easy to make. The only technique required to make a successful souffle is folding. As long as you fold the beaten egg whites into the chocolate mixture, you’ll be rewarded with a gorgeously puffed dessert that looks impressive. Since they don’t require the addition of flour, they’re the perfect gluten-free dessert. Each soufflé is topped with a sweet and creamy amaretto vanilla bean glaze. This delicately puffed chocolate dessert is infused with almond and drizzled with an amaretto glaze. Preheat oven to 400 degrees F. Butter three 2-cup souffle molds with a thick coating of unsalted butter. Sprinkle each mold with a tablespoon of granulated sugar and tap out the excess. Add the chocolate and sugar to a heatproof bowl that has been placed over a saucepan of simmering water. Heat, stirring often, until the chocolate is melted (the mixture will be grainy even after the chocolate is melted). Take the bowl off the heat and whisk in the milk until smooth. Allow the mixture to cool for about 5 minutes. Whisk in the egg yolks one at a time, and then whisk in the almond extract and amaretto liqueur. In the bowl of a stand mixer fitted with the whisk attachment or in a large bowl with a hand mixer, whip the egg whites until they hold firm peaks. Stir a quarter of the whites into the chocolate. Using a rubber spatula, gently fold in the remaining egg whites until just combined. Transfer the batter into the prepared souffle molds, filling each mold 3/4 of the way full. Place the molds on a baking sheet and bake for 25-30 minutes, or until the souffle is puffed and a thin knife or thin kabob stick (my preferred method) inserted at an angle into the center comes out mostly clean. Drizzle each souffle with a generous spoonful of the glaze. Serve immediately. These would be perfect for Valentine’s Day! Gorgeous photos! I’m with you-I hate biting into a chocolate and getting something weird that I did not want! These souffles would never disappoint me like that! They look so gorgeous and decadent! Almond extract is one of my very favorites. These are gorgeous!! I love that you used almond. Such a great combo with chocolate and I LOVE souffles. I know what you mean, I’m not a fan of guessing what’s in my dessert either. These souffles are something special! Amaretto is so delicious, I can just imagine how wonderful these taste! See, people think I’m crazy when I tell them I don’t like chocolateS. I like chocolate itself. I don’t like chocolates, as in, a box of chocolates. I HATE the surprise. I’m so glad you get me. I hear you on food surprises! I got a box of chocolate for Valentine’s Day, but there was no list as to what each item was. I hate those hard caramel centers and guess what? Half of them were hard caramel centers. Sigh. Now pass me one of those souffles! Souffles are such impressive desserts, and something about their light airiness makes me feel like they’re diet food too. :) You’ll let me keep believing that won’t you? Cause I need this souffle like whoa. I’m not a fan of surprises at all but I LOVE the ingredients in this – I can’t believe they’re so simple! It looks totally decadent.